The Detroit race riot of 1943 was the most devastating civil disorder in national history up to that time. It remains a powerful gauge by which other racial disorders can be measured. CBI - China: Day 119 of 142 of the 1st Battle of Hebei. Spain: Day 287 of 985 of the Spanish Civil War. CBI - China: Japanese airplanes attack at Wuhan. Chinese fighters shoot down 21 Japanese planes at the cost of 12 of their own. 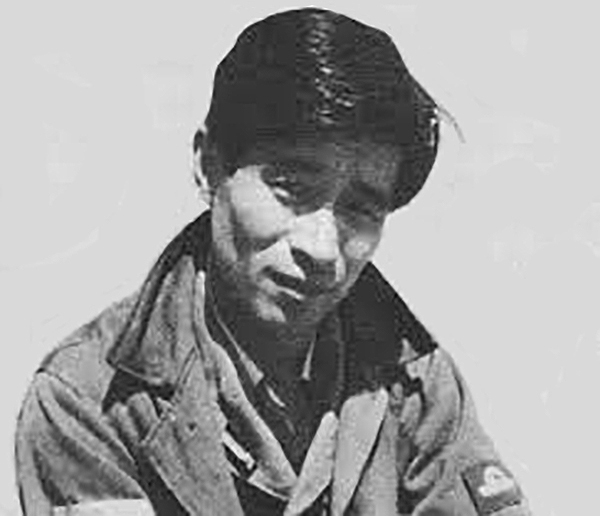 Japanese fighter pilot Tetsuzo Iwamoto shoots down several Chinese fighters this day and will go on to be Japan's disputed top fighter ace. Iwamoto was one of only a few Japanese aviators to see action over China, the Indian Ocean and the Pacific. By the end of the war, he had served as an Imperial Japanese Navy Air Service (IJNAS) frontline Chutai (squadron leader) and, in the last months of the war, a flying instructor. The Japanese Navy's unique victory-claiming system makes it hard to determine just how many kills he actually had, but post-war estimates have determined that he had probably destroyed 80-87 enemy aircraft and could well have been Japan's top fighter ace. Spain: Day 652 of 985 of the Spanish Civil War. CBI - China: Day 297 of 2,987 of the 2nd Sino-Japanese War. Day 82 of 124 of the Battle of Henan. Day 37 of 39 of the Battle of Xuzhou. CBI - China: Day 662 of 2,987 of the 2nd Sino-Japanese War. Day 44 of 54 of the Battle of Nanchang. Day 10 of 35 of the Battle of Suizao. USA: The US State Department ends its investigation of the 05 Sep 39 incident during which British personnel forcefully boarded the Filipino ship DON ISIDRO at Port Said, Egypt, and removed the German engineers. Although the US did not receive a satisfactory explanation from the British, they assumed that "similar instances will not be permitted to occur in the future." Atlantic: British sub HMS UUNITY collides with Norwegian freighter ATLE JARL in the harbor of Blyth, England, and sinks within 5 minutes. ETO - Norway: Day 21 of 63 of the Battle of Norway. The Germans march out of the Gudbrandsdal Valley and link up with other troops near Trondheim, thus threatening to surround the British. CBI - China: Day 1,028 of 2,987 of the 2nd Sino-Japanese War. Day 167 of 381 of the Battle of South Guangxi. USA: Charles Lindbergh resigns his Colonelcy in the US Army reserves two days after FDR impugns his loyalty in a speech. Public perception that had once idolized Lindbergh has plummeted through his noninterventionist stance with the American First Committee. Atlantic: German sub U-75 sinks the British passenger liner CITY OF NAGPUR 500 miles west of Ireland. 10 miles off the coast of England, a German motor torpedo boat sinks the British ship AMBROSE FLEMING. ETO - UK: Day 236 of 258 of the Blitz. Plymouth is hit again, sinking or damaging a few boats and ships. MTO - Greece: Day 24 of 25 of the Battle of Greece. 8,000 British, New Zealand, Australian, Greek and Yugoslavian troops surrender at Kalamata. MTO - Libya: Day 20 of 256 of the Siege of Tobruk. The Luftwaffe bombs Tobruk again, this time sinking the HMS CHAKLA. Middle East: Another brigade from the British 10th Indian Division lands at Basra, ignoring Iraqi protests. The Iraqi Army lays siege to the RAF base at Habbaniyh, although the RAF planes are able to fly air strikes against them. East Africa: Day 324 of 537 of Italy's East African campaign in the lands south of Egypt. CBI - China: Day 1,393 of 2,987 of the 2nd Sino-Japanese War. CBI - Thailand: Day 211 of 221 of the Franco-Thai War (Vichy France vs Thailand). Atlantic: Day 106 of 169 of Germany's Second "Happy Time," during which U-boats sink 609 Allied ships with little risk. U-108 sinks the US tanker MOBIL OIL north of Puerto Rico. U-507 sinks the US tanker FEDERAL off the northern coast of Cuba. ETO - Belgium: The Tenderloo chemical works is destroyed by a resistance group, killing over 250 people. The rate of German retaliatory executions of Belgians soon becomes 25 to 30 per month. Russian Front - North: Day 234 of 872 of the Siege of Leningrad. Russian Front - North: Day 81 of 102 of the Battle of the Demyansk Pocket, another failed attempt to break the siege at Leningrad. Russian Front - North: Day 97 of 103 of the Battle of the Kholm Pocket. Another attempt to break the siege at Leningrad. Russian Front - South: Day 182 of 248 of the Siege of Sevastopol, Crimean Peninsula. CBI - Burma: Day 137 of 164 of Japan's Invasion of Burma. Japanese troops capture Lashio in central Burma, thereby cutting the vital "Burma Road" supply route into China. CBI - China: Day 1,758 of 2,987 of the 2nd Sino-Japanese War. PTO - Malaya: Day 70 of 357 of the Battle of Timor Island. PTO - Philippines: Day 143 of 152 of the 1st Battle of the Philippines. Japanese troops land on Mindanao. The shelling of Corregidor increases as the Japanese prepare to invade the Island. Atlantic: Starting at midnight, German submarines begin a six-day attack on an Allied convoy in which 13 Allied ships and 6 U-boats will be sunk. Today begins with U-528 sinking the US freighter McKEESPORT. Russian Front - North: Day 599 of 872 of the Siege of Leningrad. Russian Front - North: Day 360 of 658 of the Siege of the Kholm Pocket. MTO - Tunisia: Day 164 of 178 of the Battle of Tunisia. RAF and US Air Forces provide Allied air support. Day 3 of 5 of the Battle of Hill 609. CBI - China: Day 2,123 of 2,987 of the 2nd Sino-Japanese War. PTO - Alaska: Day 327 of 435 of the Battle of Kiska, Aleutian Islands. PTO - Japan: The USS SCORPION sinks a Japanese patrol vessel by gunfire. PTO - New Guinea: Day 8 of 148 of the 2nd Battle of Lae-Salamaua. 5th Air Force provides air support. PTO - Solomon Islands: US 13th Air Force B-24s night bomb the airfield at Kahili on Bougainville Island. UK: Australian Prime Minister John Curtin arrives in London for the British Commonwealth Prime Ministers' Conference, aka the Imperial Conference. ETO - Germany: US 8th Air Force B-17s and B-24s bomb at Berlin. Russian Front - North: Day 88 of 191 of the Battle of the Narva Isthmus, Estonia. Both German and Soviet troops remain in their defensive positions. Russian Front - South: Day 22 of 35 of the Battle of the Crimea. Russian Front - South: Day 22 of 60 of the Battle of Romania, 1st Jassy Offensive. MTO - France: US 15th Air Force B-17s and B-24s bomb the Toulon naval base. MTO - Italy: Day 104 of 123 of the Battle of Monte Cassino. RAF and US Air Forces provide air support. The German Gustav Line continues getting weaker. MTO - Italy: Day 99 of 136 of the Battle of Anzio. RAF and US Air Forces provide air support. CBI - Burma: Day 56 of 166 of the UK's Operation THURSDAY. CBI - Burma: Day 51 of 147 of the Battle of Myitkyina. US 10th Air Force provides air support. Merrill's Marauders continue an advance on Myitkyina. CBI - Burma: Day 29 of 302 of the Chinese Salween Offensive. US 14th Air Force provides air support. CBI - China: Day 2,489 of 2,987 of the 2nd Sino-Japanese War. Day 13 of 259 of Japan's Operation ICHI-GO. Day 13 of 39 of the Battle of Central Henan, the first offensive in Japan's Operation ICHI-GO. Chinese continue retreating from central China. CBI - India: Day 53 of 118 of the Battle of Imphal-Kohima. At Kohima, Japanese troops launch a counterattack after dark. PTO - Caroline Islands: The US 7th Air Force and US Navy pounds the Japanese base at Truk destroying 120 planes. PTO - New Guinea: Day 61 of 80 of the Battle of the Admiralty Islands. 5th Air Force provides air support. PTO - New Guinea: Day 137 of 597 of the Battle of New Britain. US 13th Air Force provides air support. PTO - New Guinea: Day 8 of 481 of the Battle of Western New Guinea. PTO - Solomon Islands: Day 181 of 295 of the Battle of the Bougainville Islands. US 13th Air Force provides air support. Atlantic: During this last attack on Allied Atlantic convoys of WWII, German sub U-286 sinks the British destroyer HMS GOODALL (a lend-leased US ship). ETO - Netherlands: The RAF begins supply drops into Holland known as Operation MANNA. ETO - France: Day 274 of 284 of the Battle of Brittany. ETO - France: Day 227 of 236 of the Siege of Dunkirk. ETO - Germany: The British 2nd Army crosses the Elbe near Hamburg. The French 1st Army captures Friedrichshafen on Lake Constance. The US 7th Army enters Munich and also liberates the nearby Dachau Concentration Camp. US soldiers execute 165 German SS soldiers after they are taken prisoner. Germany: The end is near for Adolf Hitler. He marries his mistress Eva Braun in his bunker in besieged Berlin. In his political testament he justifies his political and military actions and blames the war on the Jews. Hard pressed to find many top-ranking Nazis remaining loyal to him, he appoints Admiral Dönitz as his successor. Russian Front - Center: Day 197 of 206 of the Battle of the Courland Pocket in Latvia. Russian Front - Center: Day 14 of 23 of the Battle of Settin-Rostock, both sides of the border between Germany and Poland. Day 7 of the 11-day Battle of Bautzen. Russian Front - Center: Day 14 of 17 of the Battle of Berlin. Russian Front - Center: Day 76 of 83 of the German Siege of Breslau (today Wroclaw, Poland). The Soviets continue with their siege. Russian Front - Center: Day 5 of 8 of the Battle of Halbe, Germany. Russian Front - South: The Soviet Union sets up a provisional government in Vienna, Austria. MTO - Italy: The German armies in Italy sign surrender terms at The Royal Palace, Caserta, but the German officers do not guarantee any official acceptance. MTO - Italy: The bodies of Mussolini and Clara Petacci are brought to Milan and hung upside down from lamp posts in the town square where 15 Partisans were executed a year earlier. MTO - Italy: Day 24 of 27 of Operation GRAPESHOT. The British 8th Army secures Venice and advances toward Trieste. The US 5th Army enters Milan. Both armies link up near Padua. The Allied Air Forces provide air support. CBI - Burma: Day 85 of 99 of the Battle of Pakokku and Irrawaddy River operations in central Burma. The Indian 17th Division makes a two-prong assault on Pegu but is stopped cold. CBI - Burma: Day 5 of 12 of the Battle of Rangoon. US 10th Air Force provides air support. CBI - China: Day 2,854 of 2,987 of the 2nd Sino-Japanese War. Day 29 of 91 of the Battle of Zhijiang. US 14th Air Force provides air support. Day 21 of 60 of the Battle of West Hunan (near Zhijiang). PTO - Alaska: US 11th Air Force bombs on the Kataoka naval base at Shimushu Island. PTO - Caroline Islands: US 7th Air Force bombs on Truk Atoll, Falas, Moen and Param Islands. PTO - Japan: US 20th Air Force B-29s bomb airfields at Miyazaki, Miyakonojo, Kokubu, Kanoya and Kushira. PTO - Japan: Day 29 of 83 of the Battle of Okinawa. PTO - New Guinea: Day 489 of 597 of the Battle of New Britain. US 10th Air Force provides air support. PTO - New Guinea: Day 373 of 481 of the Battle of Western New Guinea. US 10th Air Force provides air support. Japanese bombers attack Manus in the Admiralty Islands. PTO - Philippines: Day 136 of 244 of the Battle of Luzon. 5th Air Force provides air support. PTO - Philippines: Day 51 of 159 of the Battle of Mindanao Island. 5th Air Force provides air support. PTO - Philippines: Day 43 of 135 of the Battle of the Visayas region. US 5th and 7th Air Forces provide air support. Japan: 28 former Japanese leaders are indicted as war criminals in Tokyo, Japan. In eight years of near-constant warfare, 150 Japanese Air Force and 21 Japanese Navy pilots achieved "ace" status. A specially established RAF squadron made its permanent imprint on history by flying a high-risk, low-level, nighttime attack against German hydro-electric dams vital to the Nazi armaments industry.